I am sick and tired of the traffic and all these Save Tresltes stickers. If you have to go anywhere north of San Clemente on a Saturday during the summer it takes forever to get back home because of all the traffic. It backs up every weekend to Avery, Oso, or even the 405. It really made me mad when I was stuck in the backup and there was a Hummer in front of me with a Save Trestles sticker on it. I don't understand all these people in south county fighting the Toll Road. How can they stand all the traffic. The traffic is out of control, and Trestles is already a dump as it is. 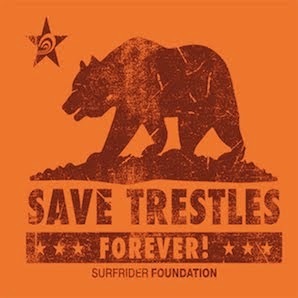 These Save Trestles people crack me up. Its the dirtiest of all the SC beaches. Every sign covered in SURFING stickers, obscene things written in SURF wax on the pavement, graffiti everywhere, and trash all over the place.It seems to me that the SURFERS destroyed trestles a long time ago, not the motorist heading south. I say SAVE SAN CLEMENTE, BUILD THE TOLL ROAD!!!! You clearly have no concept of the value of a state park, or the fact that Trestles has the cleanest water in all of SoCal, along with the best waves. It's treasured by millions. If you're tired of sitting in traffic, try living near your job, ride a bus or train, or move away. We live here because of the high-quality outdoor recreation available, not because the traffic is good or bad. There are other options, the 5 needs to be widened. OCTA has already said so. You're clueless..